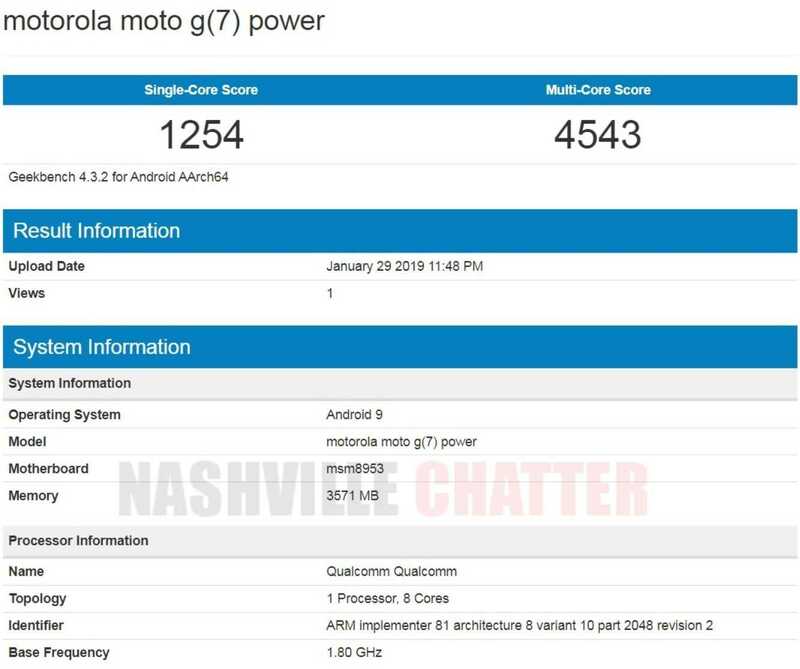 Motorola G7 Power, the most powerful phone among the four phones in the Moto G7 lineup, has been found on Geekbench today revealing that there would be a 4GB RAM variant for the phone. This information comes just a week ahead of the official event Motorola has organized in Brazil on February 7. Motorola will launch Moto G7, G7 Play, G7 Plus and G7 Power phones. We’ve already seen Moto G7 Play phone appear in Geekbench with its 2GB RAM variant and the same processor. Given that the processor is going to be the same across three out of the four phones except Moto G7 Plus (which is believed to be coming with Snapdragon 660 SoC), the performance can be expected to be quite similar as well. Geekbench scores also confirm this. The Moto G7 Play Geekbench listing had 1173 points in single core score and 4090 points in multi core score whereas this listing for G7 Power has 1254 points in single core and 4543 points in multi core score which is not a big difference, atleast for the single core score. The unique feature of Moto G7 Power is its battery life. This is the only phone in the Moto G7 lineup that will come with 5000 mAh battery. All other phones are expected to have just about 3000 mAh battery, which is quite disappointing, according to several online reports. The RAM capacity of this phone is 4 GB and it would also have a 3 GB variant. The display will be 6.2 inches with 1520 x 720p resolution. The rear camera would be 12 MP with f/2.0 aperture and the front camera would be 8 MP with f/2.2 aperture. The internal storage would be 32 GB and the phone will ship with Android 9 Pie OS.